In January 2006, four and a half months after the disaster in the aftermath of Katrina, I drove to New Orleans to join a crew of volunteers assembled by the Southern Foodways Alliance (www.southernfoodways.org) to work on the resurrection of Willie Mae’s Scotch House in Treme. Willie Mae’s is a neighborhood place in New Orleans that was designated an “America’s Classic” by the James Beard Foundation in 2005, less than four months before the storm. Willie Mae Seaton’s fried chicken is often declared the best anywhere (www.williemaesnola.com). Willie Mae passed away but her legacy is carried on by her great-granddaughter, Kerry Seaton Stewart. When I got to my hotel after an eight-hour drive, there was no room available. I produced a print-out of my reservation and confirmation number but the little French Quarter hotel – a place I had stayed at and enjoyed in the past – was full of construction workers who were working on the larger reconstruction efforts around the city. The desk clerk called a couple of places and declared there were no rooms in the area to be had at short notice. I was too tired to argue. I blame myself. When I made the reservation in December, the staff Christmas party was going on in the background so maybe – confirmation or not – my reservation was lost in their revelry. Despondent, I emailed my regrets to the SFA folks and drove back to Alabama that same night. If I had figured out a way to stay and work, I would have been working with Chef John Currence, who headed up the Willie Mae’s restoration. Currence, a New Orleans native who made his culinary mark in Oxford, Mississippi, may be as well-known for his philanthropy as he is for his restaurant brand. City Grocery, his flagship restaurant on the Square in Oxford, is a fine dining restaurant with a famously rowdy upstairs bar. Snackbar and Boure are other Currence ventures in Oxford along with Big Bad Breakfast. Big Bad Breakfast also has locations in Alabama and Florida (www.citygroceryonline.com). I’ve had a couple of great meals at City Grocery and was thrilled when it was announced that John Currence would be the guest chef for the August Friends of the Café event at Alabama Chanin’s Florence factory. He had been on my wish list of possible chefs for the series. The Friends of the Café series of chefs and dinners is always announced in advance (www.alabamachanin.com). However, the August chef is kept secret until a few weeks before the event. This dinner always happens on the Thursday night before the opening of Billy Reid’s weekend-long “Shindig” the next day. I was happy when Currence was announced in July. Currence’s dishes for the evening were paired with wines selected by Eric Solomon, a champion importer of French and Spanish wines through his European Cellars distributors in Charlotte. Solomon’s passion came through in his presentations and descriptions throughout the evening (www.europeancellars.com). Passed hors d’oeuvres included a chicken liver pate with pickled egg mimosa on grilled bread. The hearty second pass-around was kheema pao, an Indian street food stalwart, with spiced lamb, soft scramble, cilantro chutney, and slivered serrano peppers served on a hefty sweet roll. As the diners were seated, a first course of sweet corn soup with marinated blue crab arrived at the table. The course that followed was grilled summer vegetables served with spiced yogurt, smoked almonds, sweet onion, and a lemon vinegar. At the end of the night, Chef Currence touchingly revealed that the vinegar we were served was made from champagne that had been part of his mother’s cellar. The third course was a perfectly prepared beef ribeye with celery root puree, vinegar-wilted arugula, and chimichurri. The dinner ended with the most elegantly presented Mississippi Mud Pie I have ever tasted. It was a soulful, well-paced meal, pleasingly complemented by Solomon’s pairings. 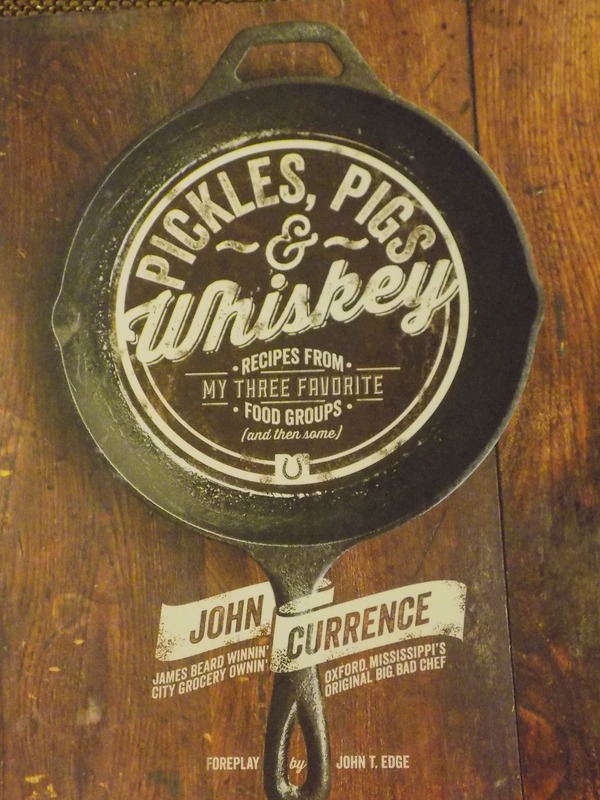 Currence’s food philosophy is on vivid display in his 2013 cookbook, Pickles, Pigs & Whiskey: Recipes from My Three Favorite Food Groups (and then some) (Andrews McMeel Publishing). The book is an enjoyable and colorful collection of profanity-laced insights on food and great recipes. Currence draws from his culinary training, international travel, a New Orleans upbringing, and long-time Mississippi residency for recipes that resonate and thrill. His culinary viewpoint is headstrong and provocative and his cookbook is a showcase for his culinary tastes and his opinions; I tend to agree with most of his takes on food, as I do with his takes on politics in his unbridled social media posts. The text of the cookbook, like the food Currence champions and serves, is honest and to the point. This is not your grandmother’s cookbook. After the dinner, Currence signed my copy of Pickles, Pigs, and Whiskey. 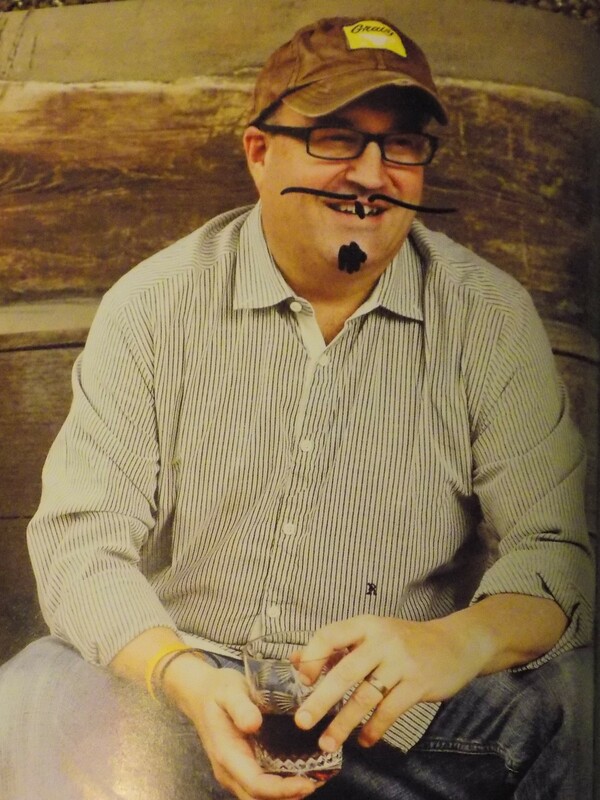 As he signed, with a typical Big Bad Chef flourish, he blacked out a tooth on his picture on the facing page and gave himself a diabolical moustache. It’s always hard to imagine how each Friends of the Café dinner might be topped. The parade of master chefs who present there seems to always come through. Add Big Bad John Currence to the list. This entry was posted in Chef John Currence and tagged Alabama Chanin, Alabama Chanin Friends of the Cafe, Big Bad Breakfast, Boure restaurant, City Grocery, Eric Solomon wines, European Cellars, Florence Alabama, John Currence, Kerry Seaton Stewart, Oxford Mississippi, Pickles Pigs and Whiskey cookbook, Snackbar, Southern cookbooks, Southern food and drink, Southern Foodways Alliance, Willie Mae Seaton, Willie Mae's Scotch House on September 5, 2018 by gedwardjourney.